What Will Happen if the Oil Pressure Switch Fails in Your Mercedes? Mercedes cars are revered for their long-lasting durability and reliability, but they are not immune to the same difficulties that every other driver experiences from time-to-time. 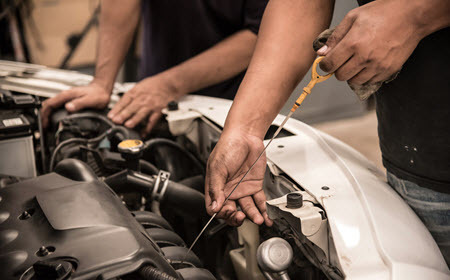 Furthermore, Mercedes cars have their own unique issues that not all cars experience, requiring the help of a Mercedes specialist to diagnose and attend to certain problems. One problem that has been documented by Mercedes drivers all over the world is oil pressure switch malfunction or failure. This is problematic, as the oil pressure switch plays a crucial role in your engine’s functioning. In this article, you’ll read about what the oil pressure switch is and what will happen if it begins to fail. We’ll also give you a brief checklist of how to attend to the issue and prevent it in the future. What is the function of the oil pressure switch? Motor oil maintenance is perhaps one of the most important automotive tasks that drivers face, even if it’s rather simple and affordable. Every three months or three thousand miles, it is standard to replace the oil and oil filter, keeping it clean and full at all times. Keeping the proper level and quality of oil in your engine at all times is critical, as it lubricates the various moving parts that otherwise would grind against each other and wear out quickly, contaminating the entire system with metal shavings. Keeping oil pressurized is important to ensure that it properly flows through he engine components that require lubrication. If the system becomes de-pressurized, the oil will not be able to make it to the destinations that require it and can lead to serious performance issues or even irreparable damage. The oil pressure switch is responsible for determining the oil level and pressure in your engine, and will warn the driver if it falls below standards for optimal engine functioning. Therefore, you can imagine the problems that can occur if the oil pressure switch fails. If you notice that the oil pressure light comes on or behaves oddly, then there could be an issue with the oil pressure switch. However, it’s important to rule-out other causes of the oil pressure light coming on – fixing the wrong problem is a waste of time and money, especially since the issue is time-sensitive. The oil pressure gauge will let you know if the system has enough pressure built up to adequately move the oil to the important engine components. If you notice that your oil pressure gauge is behaving oddly or doesn’t move at all, it’s critical to bring it in for inspection right away to avoid depriving your engine of oil and causing engine damage. The Mercedes specialists here at Tech Plus Automotive always take a preventive approach to automotive care, paying special attention to oil care and maintenance. Our clients from Scottsdale, Phoenix, Paradise Valley, and McCormick Ranch, AZ, have been coming to us since 2003 to help attend to issues like oil pressure switch failure, and we are confident that we can help prevent this issue from occurring in your Mercedes. Please contact us today to schedule an inspection or diagnostic procedure, or to talk to us about a maintenance plan to keep your Mercedes on track.